TASTE OF WHAT FERNIE HAS TO OFFER IN THE WINTER TIME. Fernie Central Reservations would like to help you enjoy all that Fernie has to offer in the winter time. From an unforgettable day of catskiing to a guided snow shoe tour or perhaps cross-country skiing around Island Lake Lodge. There’s so much more to Fernie than just skiing! Please let us look after all your accommodation and recreation needs by calling us. We’re standing by to help you make the best of your Fernie winter holiday! 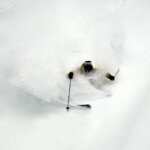 Fernie Alpine Resort is a world-class ski area renowned for its excellent natural snow conditions. The snow starts to fall at the end of November and stays well into April with an annual average snowfall of 875 cm (29+ feet). Fernie has ninety-seven defined trails, five alpine bowls and loads of tree skiing to test your skills. Experts are never bored gliding through glades, dropping off ridges, checking out chutes or making first tracks in the powder. Skiing in the Canadian Rockies is an incredible experience, catskiing in the Canadian Rockies is a once in a lifetime experience that you must treat yourself to while visiting Fernie! For those who like to have fresh, dry powder turns all day long you have to go where the lifts don’t go. 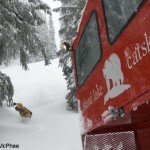 The easiest way to access those powder stashes is to join one of the 2 world famous catskiing companies located in the Fernie area. You don’t have to be an expert; you just have to love powder! 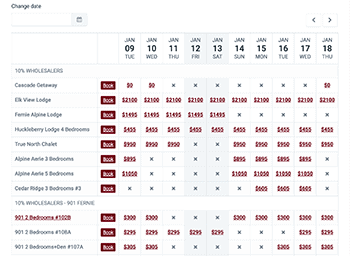 Fernie Central Reservations has partnered with all 2 catskiing companies and are happy to book your day trip while you are in Fernie. 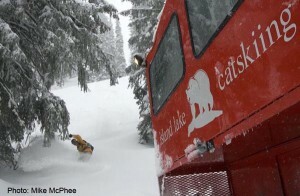 For nearly two decades Island Lake Catskiing has been at the top of the list of must ski destinations for every serious skier or boarder. The magnificent peaks of the Lizard Range in the BC Rocky Mountains tower over 7000 acres of private bowls, valleys and gladed forest. This vast, spectacular terrain topped with snow quality and quantity consistently makes for the best skiing in the world. 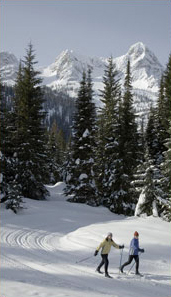 Fernie Wilderness Adventures offers a variety of skiing over 3,000 skiable acres. The terrain ranges from ridges and valleys to spectacular gladed meadows. There are hundreds of kilometres of snowmobile trails in the Fernie area with many trailheads within 30 minutes of Fernie Alpine Resort. There is a wide variety of terrain for the beginner through to the expert. Local maps are available for those with their own sled and guides and rentals are also available. 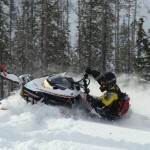 Prestige Snowmobile tours offer half day, full day and evening tours for all levels. Enjoy the beautiful backcountry with experienced, knowledgeable guides – a “must do” while visiting Fernie. Fernie Nature Tours is driven by the passion of Lee-Anne Walker who has been an interpreter in the local area since 1983. Lee-Anne has a BA in Recreation Administration and MA in Environment and Management. Her nature-based tourism company takes you off the beaten path into scenic areas to connect with the Rocky Mountain environment. Explore one of the snowiest places on earth. Discover the fascinating winter survival strategies of wildlife in the Rocky Mountains. Snowshoe across powder meadows glistening like diamonds. Silence is broken only by the soft thud as snow falls from cedar boughs. Enjoy a hot drink and homemade baking along a sparkling mountain creek before returning with rosy cheeks, fond memories and a new appreciation of winter ecology. Guided by sparkling stars, moon beams and headlamps, discover the nature of night followed by a decadent chocolate fondue beside a crackling fire. Skip the old-fashioned tennis racquet beavertails for modern, lightweight mountain snowshoes as we wind our way through a tranquil winter wonderland. Your reward at the end is a unique Swiss grilled fondue served the traditional way at Birch Meadows Lodge. Fernie offers three distinct cross-country ski areas, ranging from the valley-bottom golf course and city trail system to the more challenging terrain of Island Lake Lodge and the Fernie Alpine Resort. The Fernie Nordic Society maintain 8km/5mi of trails on the Fernie Golf Course. These trails, set for both skate and classic technique, will suit both beginner and intermediate skiers. The City of Fernie maintains the city trail system that runs along the Elk River with spectacular views of the surrounding mountains. For a more strenuous workout, try the 12 km/7.5mi climb from the parking lot to Island Lake Lodge. 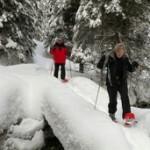 Additional groomed trails wind around the alpine lake and through picturesque Old Growth Forests. Packages that include a snowcat ride to the lodge and include a guided cross- country ski, lunch, spa and ride back down are available with a reservation. All trails are groomed for classic and skate technique, and are suitable for intermediate to advanced skiers. At FAR the trail climbs steeply to the intersection of the Silk and Manchuria trails. Both lead to the Halfway Point Hut and the 5km/3mi Scandia Loop trail. The trail network, which adds up to approximately 14km/9mi, is suitable for intermediate to advanced skiers.